As all photographers know, a business is not complete unless it has a mascot. The Phoenix Suns have the Gorilla, the University of Illinois has had Chief Illiniwek, Strobist has the Hobbit. So… during some intense brainstorming last weekend (aka glasses of wine) I discovered what has been missing in my business, a mascot. With that in mind I got in touch with my good friend Ryan and told him I needed a mascot that represented me and my vision. This mascot must be fierce and determined, yet still posses the social prowess of the modernly savvy. Said mascot must also have intellect both scholarly and culturally, a true worldly mascot. So with those parameters in mind Ryan went to the drawing boards and create a masterpiece. I feel like I should disclose a few things here: This was not originally intended to be a mascot. Rather, it was a collaboration between Blair’s wife and I in an attempt to come up with the greatest tattoo idea in history for Blair. I think he’s still on the fence about the whole tattoo thing, but if enough people leave positive comments, we might be able to push him over the edge. Also, like all great ideas, this one was stolen from an individual far more wise and handsome than myself. 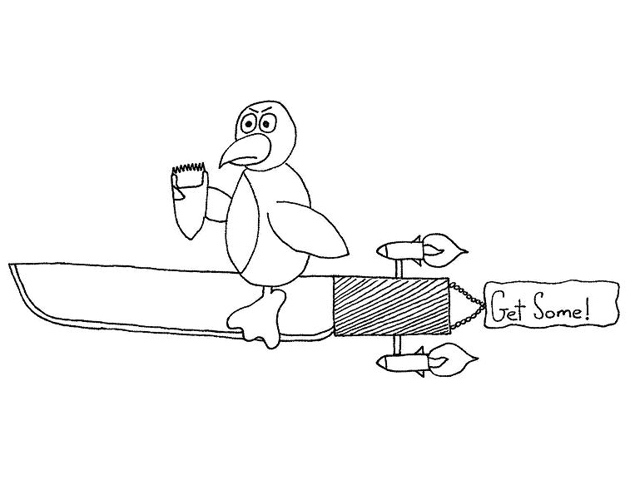 No animals were harmed in the creation of this drawing, and any resemblance to actual penguins is purely coincidental. Blair- my vote is for No Tatt. We already have too many hipster photographers with tatts – we don’t need another one. I would LOVE to see Blair get a tattoo! In fact can we film it? !